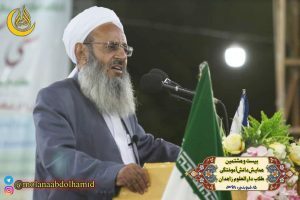 The official website of Shaikh-ul-Islam Maulana Abdol-Hamid reported that he had urged in his speech that “extremism and bigotry are in contrary to Islam” and Sunnis of Iran oppose “any kind of violence, sectarianism and insecurity”. “This ceremony is not only for the Sunni community, rather it is for all and we are well-wishers of everyone in the world. Iranian Sunnis are against insecurity in their country as well as in other countries. We oppose war and violence and worked hard as much as we could to stop insecurity in our country,” Friday imam of Zahedan added more. “There is no any rancor and hate for anyone but cruel and aggressor people who do not believe in dialogue and logic,” Shaikh Abdol-Hamid underlined. “This great and big gathering is the fruit of the sincerity of Allamah Maulana Abdol-Aziz, the founder of this seminary. You see the results of my colleagues’ efforts and donations of Zahedan’s people. We thank Allah for His mercies,” he said.